Sometimes the only thing more awe-inspiring than a city is a massive model of the city, rendered down to the finest detail. 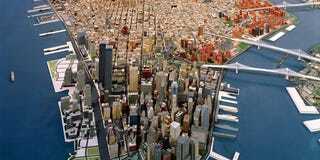 Here are some of the most obsessively-rendered models of cities that you'll ever see. And of course, they're to scale. Which is itself amazing. Panorama of the City of New York, built by a team of more than 100 people between 1961 and 1964. It was created for the 1964 World's Fair and contains 895,000 structures. The 1:500 scale (1,550 square feet or 144 square meter) planning model of Moscow, constructed between 1963 and 1968, but still updated. Some of the most important buildings are highlighted with dark wood. The Holyland Model of Jerusalem, a 1:50 scale-model of Jerusalem, Israel in the first century, measuring 21,520 square feet (2,000 sqm), designed by Michael Avi Yonah based on historical sources. Since 2006 it stands in the Billy Rose Sculpture Garden at the Israel Museum. A 1:1000 scale model of Old Havana, Cuba, made from cedar wood (Habano cigar boxes), cardboard, plastic, sand and sponge. It spans over 1,550 sq ft (144 sqm), weighs six tons and was designed and built by Orlando Martorell and his wife. A 1:500 scale (56 sqm or 603 sq ft) model of Dresden, Germany. The darker buildings are purposed developments. A 1:500 scale (250 sqm or 2,690 sq ft) planning model of Budapest, Hungary, updated between 1976 and 1990. It was stored in a warehouse for the following 23 years. A not-so-lifelike model of downtown San Francisco, built from toothpicks by Scott Weaver, who is working on it since four decades.